This Riding Center was established in 1989 as a riding school and a tourist center from where trekkings on horseback are organized. Experience the nature, culture and gastronomy of Catalonia from the Pyrenees to the wild coast of the Costa Brava through the best riding trails. The riding school Mas Batlló, located in Camprodon Valley, offers a wide range of professional services to let you enjoy the best horse riding holiday. A fantastic weekend break to gallop free crossing Alt Empordà from the Mountains to the rugged cliffs of Costa Brava Beaches. Join this horse experience to Discovery the nature and the flavours of Catalonia. You will arrive to Peralada on Alt Empordà inland a typical and small Catalan village in the middle of the mountains with stone houses. Before dinner, we will go over the week's program. You will be told about the special characteristics of our Andalusian trail horses. You will be given an introduction to the weekend programme with an opportunity for a one-to-one conversation designed to find every rider their perfect horse. Then, you can enjoy a fantastic dinner! Today, we will ride out of Llança in order to take our horses to a cute little bay where to enjoy a nice swim with the horses in an amazing landscape. We will ride to the Natural Park of Albera and then back to Llançà. Free time, farewell dinner and accommodation. Breakfast and optional transfer to Barcelona. Pace: trail with long gallops, canters, trots. Guide: the guide will be Xavi Pastoret, an experienced and talented rider, always accompanied by an English speaking back up guide. You will arrive to L’Abella on the Pyrenees, a typical and small Catalan village in the middle of the mountains with stone houses. Before dinner, we will go over the week's program. You will be told about the special characteristics of our Andalusian trail horses. You will be given an introduction to the week´s programme with an opportunity for a one-to-one conversation designed to find every rider their perfect horse. Then, you can enjoy a fantastic dinner! The trail will start from l’Abella going into the Pyrenean direction to Salarsa valley characterized with large-scale landscapes and plenty centenarian oaks. We will descent to Sant Valenti de Salarsa church, Romanesque work, and continue downhill in a valley to the road between Beget and Oix, where we will find Pont de Bolassell, a Romanesque cottage. In this picturesque and quiet place, we will have our picnic. We will continue on horseback on and uphill narrow but comfortable path in a dense forest until Coll de Salomó where we will reach the highest peak of the day (850 m). We will continue on a hill for 6 or 7 kilometres to Sant Andreu de Bestacrá, and then on a descent where we will be able to see a hundred-years-old holm oak stuck between rocks. We will continue downhill to Oix, full of natural areas of incredible beauty. Accommodation in a rural house. We will leave Beget after breakfast direction Rocabruna mountain village, a small town with 70 citizens and with the very charming Romanesque church of Sant Feliu, crossing the ruins of the old castle to start climbing up to 1600m and riding at the French border to go back to Riutort Valle to finish the day at Espinadell, one of the most important Cattle fairs from all the country. Today we will meet for breakfast and for preparing our trail very early. During this day, we are going to ride through an spectacular high mountain landscape, with peaks of 2600m and 2800m. to Vallter 2000. Transfer to Setcases and for the rest of the days you will be staying at the same accommodation. After breakfast we will be transfered back to Walter 2000 to continue our itinerary through “Infer peak” with breathtaking views over the Pyrenees and crossing the Carança lakes and Ter river to ride back down to Setcases. Breakfast and we hope see you again in one of our trails in Barcelona! This route is appropriate only for experienced riders and for fit people used to walk on the mountains, because in some parts of this trail it will be required. Therefore, we only recommend you this trail if you are in a good physical condition! Day 1. Arrival You will arrive to L’Abella on the Pyrenees, a typical and small Catalan village in the middle of the mountains with stone houses. Before dinner, we will go over the week's program. You will be told about the special characteristics of our Andalusian trail horses. You will be given an introduction to the week ́s programme with an opportunity for a one-to-one conversation designed to find every rider their perfect horse. Then, you can enjoy a fantastic dinner! After an early start from l’Abella, we begin to climb up to Costa Bona (2500m). Soon we leave the track as up here there is only rolling mountain meadows and wild flowers where we enjoy some very nice canters and gallops. Once we arrive at the peak of Costa Bona, we enter into the French territory passing the source of the Ter River. The views are immense and breath- taking, the light is that of the Pyrenees. Up here, it is very common to see eagles, vultures and herds of wild goats and deer. Then we continue our trail crossing the landscapes of Can Magre, and Portella de Mantet to reach the slope of Vallter 2000. We leave our horses here and our van is going to bring us to our hotel in Tregurà, in a well-known area because of its excellent and chary gastronomy. Today we will meet for breakfast and for preparing our trail very early. During this day, we are going to ride through an spectacular high mountain landscape, with peaks of 2600m and 2800m. From Vallter 2000, we will ride to Coll de la Marrana, crossing the top of the Freser River where we will have a picnic. After lunch, we climb up to the Pic de l’Infern from where we can admire the beautiful lakes of Carança and the valley of Coma de Vaca. Our next step is Nou Creus peak, located in an altitude 2800m, our highest peak in this trail. 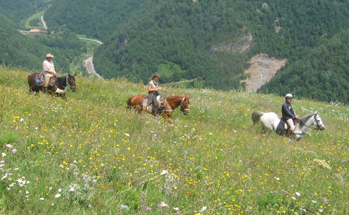 During the descent, we will enjoy long canters until reaching Vall de Núria, and until Queralbs. Accommodation in the hotel and free time until dinner. We will begin this day by riding across the French territory, crossing through some nice ski stations with an intense but also excellent ascension until the Coll de Finestrellas Mountain. From Vall de Núria we climb up to Finestrelles, crossing several times from Spain to France, with really nice landscapes. Now we start a calm descent on the hillside of Puigmal, where we prepare a delicious picnic. After lunch, we ride into the French side through Vilallobent, to enter again in Spain and arrive at Pugicerdà. Hotel in Puigcerdà. We have the possibility to enjoy our free time visiting the spa zone or also the commercial centre of Puigcerdà. Today, we will have a relaxing day with fast gallops and canters, to rest from the long journey of the previous day. We are going to ride across Cerdanya, one of Europe’s widest valleys, with a minimum altitude (about 1000 metres), with its east to west orientation, and a high dose of insolation of about 3000 hours of sun exposure a year. From Puigcerdá, the main village of the valley, we will move towards Queixans where we will ascent to subalpine mountains, to reach the alpine hut of Pla les Forques, where we will stop for the picnic. The diversity and beautiful landscape is clearly evident: from pure Mediterranean traits to alpine meadows of high altitude, you can even find sub-Mediterranean woods, beech forests, boreal woodlands of red pine trees and sub-alpine conifer woods with black pine trees and fir trees. The Park’s vegetation is considered of special interest, since its low temperatures, the high degree of humidity in the area, and its altitude have all contributed to the existence of species which are not characteristic of the Mediterranean region but of northern Europe and the high alpine or European mountains instead. After lunch, we are going to descent until La Molina. Accommodation in La Molina (a ski station during the winter). Two great mountain ridges, El Cadí and El Moixeró, meet at Coll de Tancalaporta and form an impressive mountain barrier where the main Pyrenean ridge meets the pre-Pyrenees. This is where El Cadí-Moixeró Natural Park protects not just a wonderful biodiversity but also numerous sites of outstanding natural beauty. The day begins and we saddle up and ride across the plains through fields of wheat and sunflowers. Then an ascent up to the mountain meadows where cattle & horses are sent to graze in the summer time. Here we are aware of the strength, sure footedness and stamina of the horses as they power their way up the peak. We ascent above an altitude of 1500 m until we arrive at las Barracas del Rus, a building which grazes the cattle during summer, this place has got immense green landscapes with sources of water, where we will have our picnic. After lunch, we will ride long gallops across the meadows of Pla d’Anella, in where we have the possibility to meet more than 2000 sheep in summer. Arrival at the hotel in La Molina. Day 7. Departure Breakfast and we hope see you again in one of our trails in Barcelona! Maximum group: 10 riders Guide: the guide will be Xavi Pastoret, an experienced and talented rider, always accompanied by an English speaking back up guide. 1-7 September 15-21 September 22-28 September 29 September - 5 October 6-12 October 20-26 October 3-9 November. 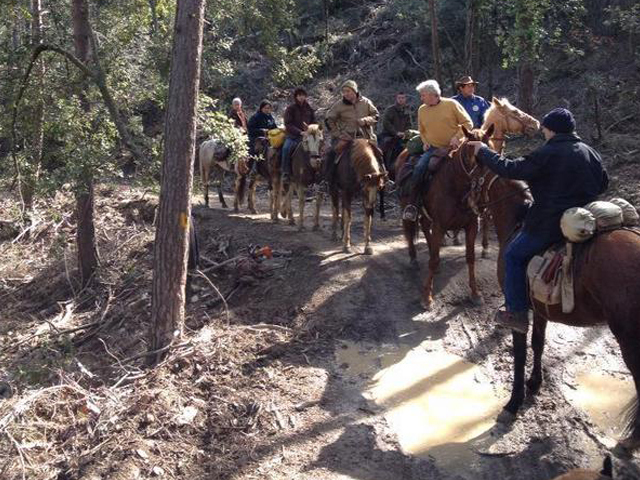 A fantastic trail, where we are going to ride our horses from the mountains to the Mediterranean Sea. We will start our trail at Girona Pyrenees, where we can enjoy the beautiful mountain landscapes and will enter into the leafy forests of Garrotxa. It has a quite mild climate; therefore, we pass the landscapes of Empordà, former the ground of wine and olive grove. At this point, we arrive to the beach where we can behold the beauty of the coast and spend some time there enjoying the Mediterranean ambience as it has plenty of beaches. The gastronomical variety of our country is guaranteed, as we offer Pyrenean veal with fish and seafood at the Costa Brava all marinated as usual, accompanied by some very great vines in every meal. You will arrive to L’Abella on the Pyrenees, a typical and small Catalan village in the middle of the mountains with stone houses. Before dinner, we will go over the week's program. You will be told about the special characteristics of our Andalusian trail horses. You will be given an introduction to the week ́s programme with an opportunity for a one-to-one conversation designed to find every rider their perfect horse. Then, you can enjoy a fantastic dinner! between Beget and Oix, where we will find Pont de Bolassell, a Romanesque cottage. In this picturesque and quiet place, we will have our picnic. We will continue on horseback on and uphill narrow but comfortable path in a dense forest until Coll de Salomó where we will reach the highest peak of the day (850 m). We will continue on a hill for 6 or 7 kilometres to Sant Andreu de Bestacrá, and then on a descent where we will be able to see a hundred-years-old holm oak stuck between rocks. We will continue downhill to Oix, full of natural areas of incredible beauty. Accommodation in a rural house. Today we saddle up and ride out through the mountains. During the morning we pass through the scented oak forests above beautiful ravines that so characterise this mountainous region known as the Alta Garrotxa. We will ride towards Vall d’Hortmoier, passing some gorges that will allow the riders to have a bath. We will cross the Llerca Riover and continue up to the Talaxà peak, a picturesque place with an old quarter from where we will be able to see the route of the day before and to enjoy a snack. From this point, we will start the descent to Vall de Sadernes, where we will have to walk for 1 kilometre. We will arrive to the Sant Aniol River where we will be able to enjoy a bath (without the horses). We will go back up to Coll de Bassegoda. After half an hour, we will enjoy our picnic in a 1.200 m height plain. We will continue on the top of a mountain range and will descent to Albanyà, through dense holm-oak woods, steep mountains and amazing views of la Garrotxa. Tracks and paths will lead us to the Muga River, which we will cross to arrive at Albanyà, a land of orchards, forests and hunting. Route with walks, trots, canter and enough gallops. A day of lively riding and excitement, because we are going to swim with the horses in a lake. An unforgettable experience! Meeting for breakfast and preparing the route will be as usual. We will leave Albañá and go down along the Muga River. We will stop at Boadella Lake surrounded by a breath-taking mountainous scenery, for a refreshing swim with the horses. Always a pleasure for both people and horses! Afterwards we get back to our route, this time we cross the GR2 with its typical landscape of Alt Empordà full of vineyards and olive groves as well as the vegetation of Albera Natural Park. This natural area is perfect to observe the pass from the mountain range and the most typical landscape to the Mediterranean metamorphous rocks made of schist and clay shale, both of these essences grow in a special terrain. We will arrive at Perelada, a gorgeous medieval village, famous because of its “cava” (sparkling wine). We will be able to stroll around Perelada and even to try our luck at the village’s Casino. Today we leave the mountains and ride through the Albera and the coastal area of Costa Brava towards the sea. From Peralada we will head to Llançà, a nice little historical village built close to the sea but quite hidden inland so it was easier for the inhabitants to protect themselves back in the 9th century! The medieval ages church and tower are the two characteristic monuments to be seen anywhere from the village.